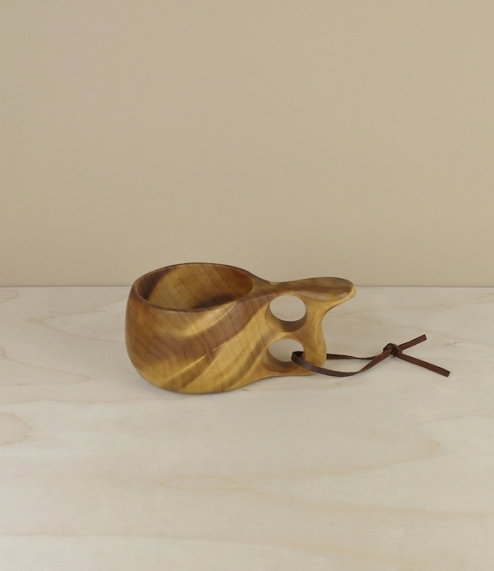 For centuries the beautifully figured birch burl kuksa has been the drinking vessel of the Sami, the indigenous people of far northern Scandinavia. Hand carved in Lapland, traditionally salted and cured, these are light, bounce if dropped, and have better insulating properties than porcelain or enamel, which of course stops them freezing to lips during arctic winters, maybe not such a problem here, but the principle remains. Can be used for hot or cold drinks, spirits, soups, and stews. Just rinse with cold water and dry after use, and occasionally (should it be required) sterilise by soaking overnight in a strong spirit of choice. Believed the ultimate camping mug, but equally good at home, and especially for small children when shatterproof properties can be of no little help. In four sizes or types, a small snaps or child's mug which holds about 90ml, a flat handled cup of about 150ml, a double finger looped mug of 200ml, and a bowl and spoon set with a diameter of about 12cm.